Watch Mazhavilazhakil Amma 2013 mega stage show on Mazhavil Manorama – 26th and 27th May. Don't miss to watch Mazhavilazhakil Amma 2013 stage show online streaming on those websites which stream Mazhavil Manorama channel. The show which was conducted on 5th and 7th of this month will be telecast on 26th and 27th April 2013 from 6.30 PM onwards. It was a great time for the members of the Association of Malayalam Movie Artists (AMMA) coming together showing their star power. 60 plus artists from among the 450 members of AMMA took part in the grandiose event which was staged at Sharjah Cricket Stadium and at Cochin Port Trust Stadium. The 4.5 hours show with potpourri of dance, skit and music is based on a theme which revolves around a village having two prominent families, led by actors Mammootty and Mohanlal competing to conduct the village festival. Another highlight of Amma 2013 mega show would be the glimpse of 100 years of Indian Cinema. Directed by T K Rajeev Kumar, this stage show will pay homage to the legends of Indian Cinema. With the title of the programme suggested by actor Nedumudi Venu, the funds raised from 'Mazhavilazhakil Amma' will be used to financially support the ailing artistes of Malayalam cinema. It would be a visual treat for the television viewers around the world to enjoy the 4.5 hours of entertainment offered by Mammootty, Mohanlal and the rest of the team. Mohanlal as Mangalassery Neelakandan and and Mammootty as Hitler Madhavan would stand on both ends while the 70 prominent actors equally divided into two groups would present a mixture of performances packed with song, dance, action and humour. 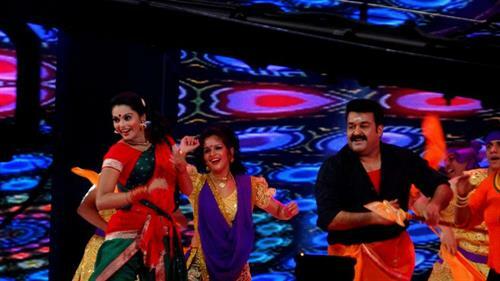 The highlight of the show would be the performance of Mohanlal who had danced for the tunes of Gangnam Style by South Korean pop idol PSY. Comedy skits directed by filmmaker Priyadarshan is another special treat. Actors like Jayaram, Dileep, Kavya Madhavan, Bhavana, Vineeth, Kunchako Boban, Fahadh Faasil, Indrajith, Narain, Asif Ali, Manoj K Jayan, Mukesh, Jayasurya, Nedumudi Venu, Lalu Alex, Devan, Maniyanpilla Raju, Kalabhavan Mani, Suraj Venjaranmoodu, Harisree Ashokan, Tini Tom, Bhama, Mythili, Ananya, Bindu Panicker, Lakshmi Gopalaswamy and Meera Nandan has given their best act on stage. Millions of television viewers and movie enthusiasts have been waiting for the mega show to get telecast in the channel. Mazhavil Manorama, the official partner of the Mazhavilazhakil Amma will be telecasting the show on 26th and 27th May 2013 from 6.30 PM onwards. You can also enjoy the mega show on those websites which stream Mazhavil Manorama channel.